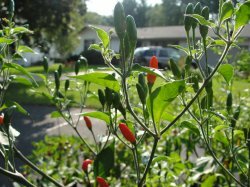 This ancestral type is a hot chile pepper, also known as "bird pepper", that is commonly used as a spice. Pequin has a compact habit growing typically 0.3 - 0.6 meters tall, with bright green, ovate leaves and small fruits that rarely exceed 2�cm in length. Like most chiles, fruits start out green, ripening to brilliant red at maturity. Flavor is described as citrusy, smoky, and nutty.